Insects fall into two categories: the kind that ruin an otherwise great picnic, and the kind that eat those pests! If you garden, you likely already know that beneficial insects can help tame the population of the ones that eat plant leaves and produce. It’s easy to draw good insects into your garden with the right plants, and it’s less toxic than using pesticides that don’t distinguish between the harmful and the beneficial creatures. Want to reduce the population of aphids and mites in your garden? Attract lacewings by planting Dill-fernleaf in your garden. Dill is tall and airy and doesn’t block sunlight, so it can be planted anywhere in the garden. The lovely lacewings will feast on small insects and their eggs. The bonus? You’ll have delicious dill leaf to use in recipes all summer long! Cilantro is an herb that attracts ladybugs, popular for eating undesirable insects and eggs when they’re young. This short herb is best planted at the outside edge of the garden, so the aromatic leaves (cilantro) may be clipped continually throughout the growing season. Parsley-Triple Curled is another short herb, best planted at the edge of the garden so leaves can regularly be clipped. Parsley attracts tachinid flies and hoverflies that feed on aphids and mealybugs, among other damaging pests. Parasitic mini-wasps destroy a variety of nuisance insects by implanting their eggs inside the host. The eggs feed on the host and eventually kill it. Invite these beneficial guests to your garden by planting Dill-Fernleaf, Parsley-Triple Curled and Cilantro throughout your plot. Lavender is not only a fragrant and beautiful annual, its delicate purple flowers attract parasitic mini-wasps and hoverflies. Lavender grows in bushy clumps and should be planted at the outside edge of the vegetable garden, where it can add aesthetic interest, as well as lure the most beneficial insects. At the end of the season, clip stems and flower buds for drying and using in sachets and potpourris. True Lavender fans use the leaves and flowers to make essential oils for flavoring exotic ice cream and candy treats. Perennial herbs Mint-Spearmint and Speedwell (Veronica) have many medicinal and dietary uses, and their tiny fragrant flowers draw big-eyed bugs, hoverflies and ladybugs. Since perennials come back each year, you should choose their growing spot in or near the vegetable garden, but allow for their perpetual reappearance each spring. Spearmint can be especially invasive and is best contained with plastic barriers to block the spread of the roots under the soil line. Enjoy the beauty, fragrance and culinary uses of these herbs as you infuse them into your vegetable garden to provide the benefit of fewer pesky insects. 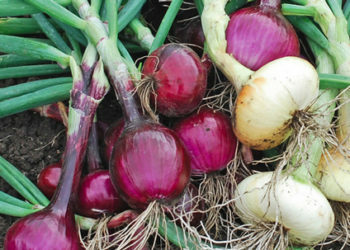 Which type of onion should I plant? I am having problems with Raccoons what can I do to keep them out of my newly planted baby plants?